As often happens, the May weather has proved fickle, so much so that we lost our entire programme over the second weekend of the season (plus the first match in the Wilds Sports 20/20 Evening League), and the First XI game against Hartley Wintney II on 19th May was played on a damp pitch and then shortened by a 33 minute stoppage for rain.. The Firsts have won their games against Hartley Wintney, Steep and Basingstoke and NH, the latter being a keenly fought low scoring game with ‘Parish posting 158 for 9 off their 45 overs, and Basing stoke &NH losing their last wicket with only 147 on the board. On June 9th, the visitors, Purbrook II posted a very challenging total of 286 for 5, and ‘Parish, needing a six off the last ball of the match, could score only 4 runs, thus losing by one run. Both the Basingstoke and Purbrook games have been very close and good cicket to watch. The Seconds have had 100% success in their programme so far. Following their win against Shrewton II, they have beaten Thruxton, East Tytherley II, Steeple Langford II and Leckford II. Several of the older Colts have become regulars in the Seconds and have put in impressive and valuable batting and bowling performances. We have played only one game in the newly formed Wilds Sports 20/20 Evening League, due to bad weather and the opposition failing to raise a team, but we did have a good win against Wickham on June 5th. Longparish under 15s have had a successful few weeks in which they won 4 out of their 5 games. Some superb bowling performances have been backed up by some outstanding fielding. Monday night fielding drills have really paid dividends. Longparish under 13s are an under 12 side, made up of under 11 and under 12 boys. They have yet to win a game but have competed well, against older and bigger teams. Their day will come soon. Against Hursley Park in the Longparish drizzle, superb bowling by Jack Tosdevine, Ben Unsworth and Matt Jackman reduced Hursley Park to 8 for 5. William de Cani picked up 2 wickets as Hursley Park closed their innings on 44. Longparish’s reply slumped to 17 for 6 before Stuart Tognarelli thumped 29 runs to seal victory in the 13th over by 3 wickets. The first of back to back games for Longparish U15s in the preliminary round of the Millard cup was against Easton & Martyr Worthy. Once again Longparish started the game well, reducing Easton to 13 for 5. A superb display of fielding from Longparish instigated four run outs. Stephen Bearpark throwing down the stumps at the bowlers end from square leg was the pick of the run outs. Easton were all out for 36 in the 14th over. Stuart Tognarelli thumped 23 as Longparish cruised to victory by 9 wickets. The following night Longparish U15s played host to Eastleigh in the first round of the Millard cup. A steady bowling performance restricted the Eastleigh score to 96 for 5 from 20 overs. Stuart Tognarelli and Jack Tosdevine struck 27 runs from the first three overs before falling in the fourth over. Longparish slumped to 52 for 5 before Ben Unsworth featured in two twenty run partnerships, the first a sedate one with William de Cani, the second an explosive one with Oliver Lee who was dismissed for 16 from 9 balls. Ed Healey struck the winning runs for Longparish who won by 2 wickets. Longparish U15s comfortably beat Trojans by 8 wickets. Jack Tosdevine took four wickets, Longparish restricting Trojans to 93 for 7 from 20 overs. Longparish’ reply got off to its usual crash bang wallop start, Stuart Tognarelli reaching 35 and retirement in the 9th over. Longparish’s reply stuttered at 47 for 2 before William de Cani (27*) and Matt Jackman (13*) doubled the score in a partnership of 47 that sealed Longparish’s victory by 8 wickets. Longparish faced a strong Andover A side in the quarter final of the Millard cup. Andover A scored 112 for 5 from their 20 overs. Adam Stone was the pick of the bowlers taking 2 for 15.but Longparish’s fielding was blighted by four dropped catches. Andover A clung on to the eight catches that came their way as Longparish tried to maintain the scoring rate at five and a half an over. Ollie Brit was the top scorer with 21 as Longparish fell to their first defeat of the season. Longparish U13s took on Titchborne, a division 1 side made up entirely of under 13 boys. Longparish’s precocious U13 side were first in the field, William Jackman and Alex Coetzee picking up early wickets. Titchborne scored quickly in their middle innings before Tom Burley and Michael Taplin took wickets to dismiss Titchborne for 65 from 17 overs. Longparish’s reply was shaky one; maintaining the run rate they lost wickets steadily. Despite the best efforts of Nick Bearpark, Dan Pomroy and Jordan Dennis, Longparish fell 11 runs short of their target. William de Cani made the top score of 27. Some members have wondered when their membership expires and even offered to renew it without being asked. Thanks for your support. At £1 for a year membership is excellent value and if you joined early you get a free bonus because your first membership fee lasts until 31 January 2008, whenever you joined. 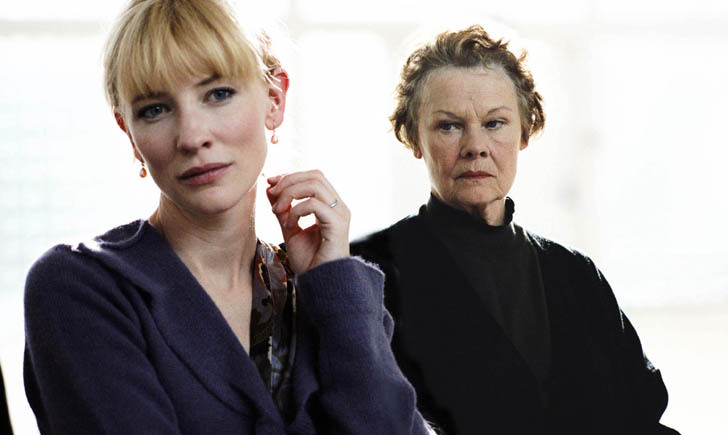 Two women caught up in a drama of need and betrayal are at the heart of this psychological thriller, starring Dame Judi Dench as Barbara Covett, a domineering and solitary teacher who rules with an iron fist over her classroom at a decaying state-run secondary school in London. Save for her cat, Portia, Barbara lives alone, without friends or confidantes - but her world changes when she meets the school's new art teacher, Sheba Hart (Cate Blanchett). Sheba appears to be the kindred spirit and loyal friend Barbara has always been seeking. But when she discovers that Sheba is having an incendiary affair with one of her young students (Andrew Simpson), their budding relationship takes an ominous turn. Buy your tickets in advance (recommended) from the village shop, or by contacting Emma Smith on 720034. We welcomed 3 new entrants to the June race which gave us a record turnout of 20 runners on a very hot day. Despite the hot and humid conditions most people improved on their previous times. Well done! Special mention goes to Sandra Jones and Andy ffolkes who were our most improved competitors. If you could bottle the look on Sandra's face and sell it we'd all be rich. The next race is on Sunday 8 July starting at 10am at the Cricket Ground. Please come and bring a friend. 7- 11pm in Longparish Community Hall, featuring Quick Exit and Nouveau Spin. This year the bands will be in the hall, with seating available on and around the patio area – bring your own picnic and drinks, tables and chairs, unfortunately no room for gazebos. There is limited parking at the hall, so please either walk or park in the village hall car park. All profits from the evening will go to Kidz Zone. The Club’s skateboarding evening at Longparish’s half pipe skate ramp is on Wednesday, 11 July 2007, from 7:00 p.m. to 9:30 p.m. It will be a demonstration and training session, provided by an expert who runs skateboarding at The Depot in Andover, Graham Inchley. Parental permission forms are available from Andrea Hulme on 01264 720347. Protective knee/elbow pads and helmets are required to be worn for insurance purposes. Please beg or borrow a skateboard and protective gear, or bring your own and be prepared to lend it to your friends. Parents should drop off at 7:00 p.m. and pick up by 9:30 p.m. at the Skate ramp and the cost will be the usual entry fee of £1, with tuck shop refreshments available. If the weather is bad then the Club will be at the Village Hall. Thank you to Elaine and Steve Mancini who have raised a further donation for Kidz Zone of £50 from a hog roast held to celebrate Elaine’s birthday, and to Kelly, Suzie, Sarah and Kirby who kicked up a storm with a sponsored Can-Can. Kidz Zone is most grateful for the donation, which will go towards subsidising a future special event. This is a call for help as Kidz Zone will need two new Club Leaders. As Trevor and I are planning to move from Longparish, the Youth Club is looking for 2 new faces to help on a regular basis. All it needs is to be able give up 21/2 hours to attend Club on a Wednesday evening once or twice a month. It is not a huge commitment but a very satisfying one - to see Longparish’s youngsters safely enjoying themselves. Please contact Andrea (as above) or Cheryl on 01264 720581. Club will meet at the Skate Ramp on 11 July and at Village Hall on 25 July. Visit the Kidz Zone website at www.longparish.org.uk/kidzzone. Ella Scott and the ladies of North Acre are hosting afternoon tea 3.00 pm until 4.30pm on Wednesday, 11th July in Ella’s garden at 95, North Acre. Do come along and enjoy the company of your old friends and neighbours and maybe meet some new ones. This year’s ‘Murder Mystery’ play by the Longparish Players will be a little different. For a start there’s no murder! There will, however, be plenty of mystery, intrigue, fun and audience participation. This year the Players will be performing “Who’s been Eating My Porridge?” in which The Three Bears return home from their walk to find things not quite as they should be. Someone has been eating the porridge and, surprisingly, there are several fairytale characters who are all likely suspects. All you have to do is to spot the clues and name the guilty party. It promises to be a lively and enjoyable evening for everyone. Proceeds are for Longparish Playgroup. Tickets are £5 (£1 for children) and are available from Longparish Playgroup or any Playgroup Committee member. Please bring food and drink to enjoy whilst you are thinking things over and discussing the clues (or indeed the quality of the performance). For further information telephone Andy Smith on 720034. Trevor Colgate was born in Reading, the son of an industrial chemist. Like his father he was educated at Eastbourne College and then went to Reading University where he read Agriculture. It was there that he met Trish who became his first wife. He farmed at Wolverton for some years and then did a year at the Burleigh Manor Hotel in the New Forest studying hotel and food management. In 1964 he and Trish came with their children, Sarah, Heather, Robert and Richard, to The Plough in Longparish, which was to become their home for the next 27 years. They transformed what I am told was a fairly ordinary village pub into the best pub in the area at that time. It was noted for its good food and friendly atmosphere, and achieved Egon Ronay status. It was the first pub in the rural Andover area to do good food, and the pub was as important as the food. Trevor had a great lust for life and he loved to spoof his faithful clientele - Barney with his liver hanging over the edge of his barstool, Steve Kimber, Tommy Thompson, Geoff Cook, Alan Stratton and others. I learnt to spoof at the Plough, very expensive lessons they were too. Many celebrated people came to the Plough, Leslie Thomas, Graham Hill, and a host of cricket writers, commentators and famous cricketers brought there by John Woodcock. He was a very “hands on” landlord; not for him a succession of managers and staff to allow him regular days off. He and Trish ran it with a loyal band of waitresses and bar staff, some of whom worked there for years. Trish created a lovely garden at the side of the pub and, I am told, Trevor loved to take his breakfast out there on a fine summer’s morning to enjoy the beauty of the garden. One of Trevor’s main interests was choral singing and he had been a member of Reading and Newbury Choral Societies. Until his last illness he attended many of the Waynflete Singers’ concerts as well as Evensong in Winchester Cathedral. He loved Christmas carols and for many years he invited me to bring a choir to sing before Christmas to raise money for various charities. He could also be persuaded, without too much difficulty, to play his harmonica at the end of an evening’s jollity. Trish inherited a house in Newnham and moved there, and for a while Trevor commuted between the two, but eventually gave up The Plough in 1991. It was the end of an era. After Trish’s death in 1994, Trevor lived with Sarah for a while, but then moved to Winchester in 1995. In 1996, Pat, who had known Trevor for years and shared his love of music, moved from Stockbridge to join him in Winchester. They gave to each other the love and comfort which both had missed with the loss of their previous spouses, and they married in 2001. In 1996, Trevor and his family had suffered a tragic loss in the death of his youngest son, Richard. He was very proud of Richard’s work as a thatcher. He took great pride in the success of his surviving son, Robert, who runs his own very successful company making stainless steel products for prestigious projects.. In 2004 Trevor had kidney failure and developed Myeloma, which eventually progressed very painfully. His death released him from this dreadful burden which he carried with great courage. During these last years he was lovingly tended by his wife, Pat, with help from the family. I am sure it was a great joy to him as well as to Heather that she was able to return from Australia to see him before he died. We are all of course sad at Trevor’s passing, but none more so than Pat, Sarah, Heather and Robert. Let us all rejoice that we knew him and be glad in our hearts for the happy memories that we had of him and the great fun and friendship that he gave to us. You will shortly be receiving a briefing note on the key issues around an Affordable Housing project for the village, with some key facts and a range of views represented. This will be followed by an Open Forum during which you can explore the issues that may concern you in more detail. More information next month. Please put the date in your diary. Whatever your interests, you are guaranteed to have a great time, so don’t miss it. Look at www.newforestshow.co.uk for information, discounted tickets and the best way to travel to this popular event, by car or let the train take the strain. Tickets also available now by ringing 01590 622409. This report covers the June meeting. Minutes of meetings are on the village website www.longparish.org.uk. Becky Bourne from North Acre and Toby Cooper from Middleton were co-opted to fill two of our three vacancies. Thank you both very much. Would anyone who would like to find out more about filling the last place on the Council please contact the Chairman (details below)? The Council had no objection to an application by Mr & Mrs McSloy for an extension at the rear of The Thatch, The Common. You may be interested to know a bit more about Tesco’s plan for a new warehouse on the Andover Airfield site. The building will be huge with over 100 loading bays. The depot will serve the whole of the South East and because it is on the edge of that area most of the traffic will use the A303. Monxton council advised the recent Test Valley Association of Parish Councils meeting that there will be two lorry movements a minute, night and day. Bear in mind that the lorries have to attend at a pre-booked time and you can imagine that they may well arrive in the area a bit in advance and then park to wait for their slot. So we may have interesting times ahead if it goes through. The working group is still working on a document to be circulated to every household to explain the issues. The date for the Open Forum has been set for Saturday 22 September in the Community Hall. Thanks go to the volunteers who maintain our footpaths. At this time of year they have quite a struggle to keep the rampant growth under control. One thing that puts them off is strimming dog mess. There are few worse experiences. Please ensure that you do not allow your dog to foul our paths and the verges next to them. And if they do, please bag and bin the mess. Thank you. HCC are putting the finishing touches to the new leaflet. Persistence pays! Highway engineers have finally cleaned out the blocked drains which caused flooding by Meadowsweet and in Forton. Thanks go to our Borough and County councillors who have helped us to press for the drains to be properly repaired and maintained. The next Council meeting is on Monday 9th July in the Ellicock Room at the Community Hall. Meetings are public and all parishioners are welcome to come and can speak by invitation. Pupils behave very well without any diminution of their individual	personalities! There will always be things we can and want to do better in school but overall the report has captured a lot of what I would call the spirit of Testbourne. The full report is only a few pages long and can now be found on the Ofsted and the Testbourne websites, should you wish to read the whole document. A number of long-serving members of staff, who are very well known to many of you in the community, are retiring at the end of term. Selwyn Naylor - Head of Science, Pam Evans – Head of Modern Languages, Ina Oakes – Head of Year and 2nd in English, Peggy Ormston - Co-Head of Maths and Angela Aps – our Administration Officer will all be taking well-earned retirements. Their departure will be a big loss to the school as they have so much knowledge and experience between them. We thank them for all they have contributed to the life of the school and wish them the very best for the future. This summer sees our first Testbourne Arts Festival which runs from Saturday 7th, starting with Testbourne Rocks, to Saturday 14th July. Pupils will have the opportunity to join in with sessions on salsa, street dance and Irish dancing classes as well as strings, woodwind, pan pipe and drama workshops led by experts from out of school. There will also be evening performances open to the public including A Night at the Musicals on Monday 9th, a GCSE showcase on Tuesday 10th and Wednesday 11th, a joint performance with our primary partners of the Emerald Crown on Thursday 12th, a beginners’ Ballroom Dancing class on Friday 13th and a professional jazz band concert on Saturday 14th. For full details contact Kirsty Sagar Goldsmith on 01256 892061 or 01256890223. Our wonderful, reliable and efficient cleaner has left the village and the Longparish Village Hall Committee is looking for a replacement. The job takes about 6 hours per month, or an hour and a half per week, to suit the person concerned and the users of the Hall. The pay is £42 per month which equates to £7 per hour. On Monday 11th June we went to Middleton Estate. First we went, with hearts beating, to the crops. There was a man waiting for us. He showed us how the crops came to be sold. Unexpectedly, he told us how much the combine harvester was. It was a quarter of a million pounds. We only saw the tractor but the combine harvester must have been huge because we saw the tractor, which was ever so big and the man said it was two times the size. I gasped at that! After that we went to a garden. We saw alpacas. There were so many different types. The man who owned the garden was the owner of everything! After we had done some activities in the garden, we went and saw some game keepers. They had traps for: foxes, rabbits, rats, mice, magpies and blackbirds. Finally they had a trap for crows. Next we went to see a lady with 15 dogs. Our group saw her show us very young dogs and quite old dogs. The youngest dog was so sweet and was working, so had to be good. I threw the dummy for him and he bounded off and when I called Kite (that was his name) I expected that he would come back, but he had to go for lunch. It was a nice morning I thought, but there was still some more to go! We next went to see the wood cutter. He gave me some wood. He said that I could take it home. Then we went to see some river men. They had pots with blood suckers in. After that, the final thing was looking at deers’ skulls. I found this fascinating. Then we went and said goodbye and went home to school. Mrs Ellicock came and planted up the new raised bed outside Robins’ Class. Every child planted a plant and took one home to grow on. The whole class walked down to Forton to see the trout being restocked in the river. Mrs Graham provided refreshments and then, with permission from Mr. Smith, we all walked back along the river bank enjoyed the sights, sounds and smells of a fresh May morning. The July lunch is on Tuesday 17th July at 12 noon. Please ring the school on 01264 720317 to book a week before. Transport is available if needed. will take place on Saturday 8th September. If you would like to help run a stall please contact Patrick Beresford on 720421. Please Bag it and Bin it. Dog mess is disgusting to tread in and a hazard to health. Please bag it and bin it. If you don’t then your anti-social behaviour can lead to a fine.